Marvel Studios continues to deliver the post-Avengers goods as Captain America: The Winter Soldier proves to be another confident hit that stands on equal footing with their afore-mentioned 2012 cinematic juggernaut. It works equally well as a sequel to Joe Johnston’s Captain America: The First Avenger (2011) and as a follow-up to Avengers Assemble and as with Iron Man Three and Thor: The Dark World (also forming part of ‘Phase Two’ of Marvel’s Cinematic Universe) more than capably stands on it’s on legs and assuredly so. The Winter Soldier is more than just a standard superhero flick with some surprising depth in terms of character and story that meshes neatly with the anticipated (nay, expected) spectacle of a comic book action blockbuster. The story itself (wisely drawing on the fan favourite comic book run by writer/artist team Ed Brubaker and Steve Epting) is enhanced by a strong script, delivering equal measures of action, excitement, drama and even the odd dash of wit that feels more humble than the at time near-slapstick tendencies of Iron Man and Thor. As many reviewers have cited, TWS is both a political conspiracy/espionage thriller, with its numerous twists and turns, and rollercoaster blockbuster serving up a series of well-staged and often visceral adrenalin-fuelled action sequences from the opening assault on a hijacked freighter, increasing the stakes and intensity right through to an epic and visually stunning and searing showdown with the film’s main antagonist. Chris Evans (not, not me unfortunately) once again provides another likeable and even relatable performance as Rogers/Cap, a man out of time who refuses to waver in his beliefs and convictions – he may be Captain America but, much like Superman, his moral values are universal. Evans is capably matched by Johannson, delivering her best turn thus far as Natasha Romanoff/Black Widow who gets plenty of dramatic meat to chew on in between femme-fatale sassiness and a** kicker-y and Samuel L. Jackson makes a welcome return as S.H.I.E.L.D. Director, Nick Fury. Joining the ‘team’ is Anthony Mackie as Cap’s new pal, Sam Wilson (aka Falcon) who shares good chemistry with his co-stars and adeptly handles both the action and drama (with some well integrated commentary on PTSD) and Marvel bag another impressive A-list veteran with Robert Redford as S.H.I.E.L.D. founder Alexander Pierce. As to the Winter Soldier himself, he is a force to be reckoned with and a chilling opponent for our heroic Super Soldier…but I’ll leave that for you to discover for yourself! Succeeding Joe Johnston are the Russo Brothers (Welcome to Collinwood) who prove the perfect choice for a film that brings Cap smack bang (literally, both with his fists and shield) into the present and keep the action tight, frantic and tense balancing the large scale pieces neatly against the slower-paced dramatic sections. Even at over two hours it never feels like a drag, thanks to the intrigue and strong character focus. Completing the package are the usual fan-pleasing easter eggs with surprise cameos and references to the wider Marvel Universe sprinkled throughout together with the traditional post-credits scenes providing tantalising hints of what’s to come as Marvel plough ahead towards next year’s Avengers: Age of Ultron. The bottom line: Marvel Studios keep hitting the mark and with Captain America: The Winter Soldier have confidently delivered their best film since Avengers Assemble. It’s exciting, thrilling and fun without sacrificing character and story and will leave you hungry for more Marvel-ous entertainment! Captain America: The Winter Solider is in cinemas across the UK now and is released in theatres in the U.S. on 4th April. What did you think of Captain America: The Winter Soldier? Share your spoiler-free thoughts below! 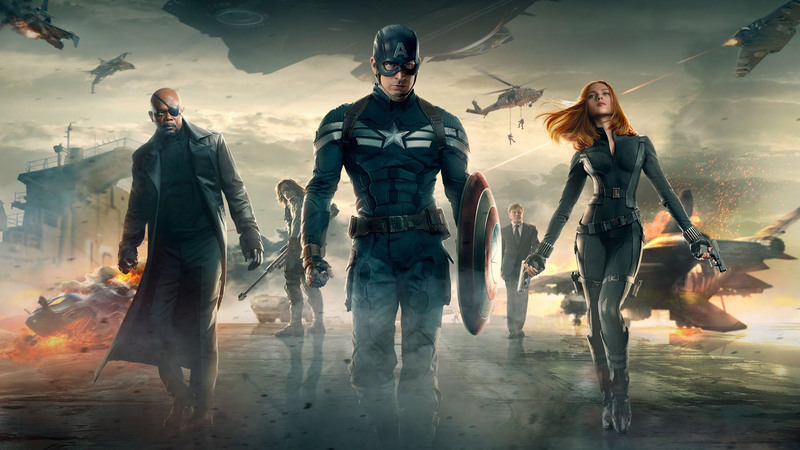 Marvel Studios hits the mark yet again with ‘Captain America: The Winter Soldier’!